Dating back to the 11th century, the exquisite green and gold-domed St Sophia Cathedral was an important power centre for the Soviet Union. It has been damaged and repaired many times over the years, and today is a blend of architectural styles from nine different centuries. Perhaps one of the most striking aspects of the cathedral is its impressive collection of Byzantine mosaics and frescoes that date back to its inception. 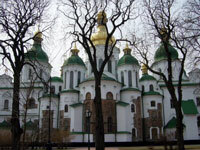 A UNESCO World Heritage Site, the St Sophia Cathedral also serves as a living text: hundreds of pieces of graffiti relating to political and historical events spanning the centuries can be read by visitors today.